June kicks off immediately on Friday the 1st. Linda Mizzi’s band will be at Wallacia Golf Club continuing our album launch. Buy yourself a copy and listen to what some of the great reviews are talking about, let me know and I’ll ship one out to you. The next night, Saturday 2nd of June CK & the 45’s will be back at The Old City Bank, Katoomba for the usual Western Swing mayhem and madness. If you like dancing, whiskey, and wild music. This is the Blue Mountains gig you should be at. CK & the 45’s then takes it easy on Wednesday the 6th of June in Duo Mode. Cam and I hit The Different Drummer Bar in Glebe from 8pm till late. The next night, on 7th of June – The Snakemen are back at Bar No.5 Alexandria from 6:30pm – Bringing with them some delicious old school blues and roots music, with a hint of dessert mesquite. This is the big one…. 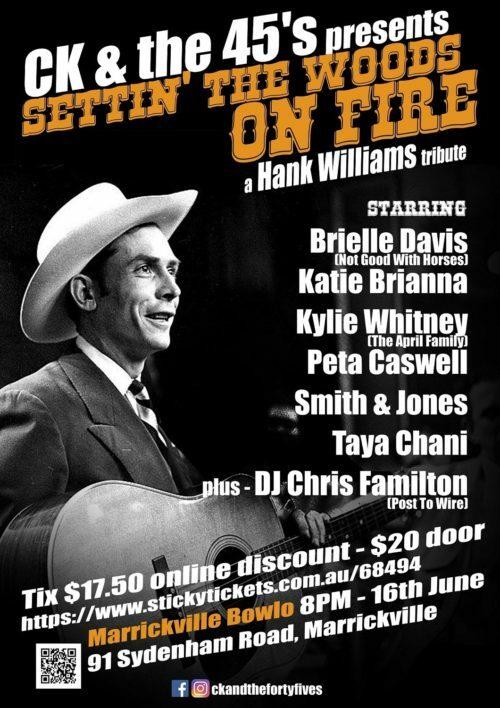 CK & the 45’s are Setting’ The Woods On Fire, and putting on the biggest Country Western evening in Sydney you’ve ever seen – This is a huge Hank Williams Tribute night at Marrickville Bowling Club. Tickets are available online for a discounted price of $17.50 HERE– $20 at the Door. This show brings all of Australia’s top Country and Americana performers into one place. We’ll be joined by performers such as Brielle Davis – Not Good With Horses, Katie Brianna, Kylie Whitney – The April Family, Peta Caswell, Smith & Jones, Taya Chani, and special guest DJ set by Chris Familton of Post To Wire. Then CK & the 45’s go back into Duo Mode and hit the Temperance Society Bar in Sydney on the 21st of June. We kick off a slick and easy 45’s show, taking our Western Swing right back to its roots. The Winter Magic Festival is on hiatus this year. But that’s not going to stop us celebrating this years Winter Solstice. Kicking off from the 23rd of June, as we begin to get cosy in to Winter, Linda Mizzi’s band will be performing on a number of occasions for the Blue Mountains Winter Solstice Festival. We’ll be at Hotel Blue from 6:30pm performing songs from our new album! That about sums up June. Phew! See you there!